The "Wado" story officially began in May 1934 when Hironori Ohtsuka registered his own style of Karate, which he called "Wado Ryu" and was recognised as an independent style. However, its origins were developed by Ohtsuka's continuous study of all martial arts, formulating the "Wado" techniques by combining his own innovations and natural movements found in the other martial arts. The full "Wado" story began in June 1892 when Hironori Ohtsuka was born. He was born in Shimodate City, Ibaraji, Japan, the first son of Dr. Tokuiuro Ohtsuka, a Doctor of Medicine. Ohtsuka was first introduced to the Martial Arts by his great uncle Chojiro Ebashi who began teaching him Jujitsu. This marked the starting point of his life-long fascination and obsession with the Martial Arts. Ohtsuka continued his studies of Shindo Yoshin Ryu Jujitsu whilst at Waseda University from 1910 to 1917 reading commerce. Ohtsuka also studied different styles of Jujitsu, experimenting between styles concentrating on their "positive quality". During his period at University he was able to examine the techniques of most Martial Arts. He developed and improved certain techniques of the existing arts combining them with other "innovative" techniques. Whilst studying Ju-jitsu, Ohtsuka learned a great deal about the body's "vital points" both for attacking and healing purposes, he also studied the art of "bone setting". In 1917 Ohtsuka joined the Kawasaki Bank, during the year he met Morihei Ueshiba Sensei, the founder of Aikido and this began a deep founded influential friendship. After two years at the bank Ohtsuka Sensei decided to become a full time Martial Artist. His mother, however, opposed this, wishing her son to continue his career in banking. Out of respect for this mother and family he postponed his ambitions, but continued to study Jujitsu. Ohtsuka was awarded on 1st June 1920 the highest degree of Shindo Yoshin Ryu Jujitsu, which allowed him to succeed his master's position as fourth Grand Master. The 1922 sports festival in Tokyo was to continue his obsession with all Martial Arts. For the first time Ohtsuka was to encounter Karate. Gichin Funakoshi Sensei was invited by the Japanese Education Department to demonstrate his style of Okinawan Karate (Tode). Kano Sensei, a renowned Martial Arts Instructor, accepted that the spirit behind karate was the same as Japanese Martial Arts, which served to promote its message and style. Ohtsuka was impressed with this newly promoted Martial Art. He visited Funakoshi Sensei on numerous occasions during his stay, discussing techniques and other aspects of Karate. Funakoshi Sensei prolonged his visit by invitation from the Japanese Education department. He was "impressed" by Ohtsuka's enthusiasm and determination to understand Karate and agreed to teach him all he knew about Karate. Within the space of a year Ohtsuka Sensei had studied all the katas that Funakoshi had brought from Okinawa, although he found certain movements and techniques difficult to implement and understand. This led Ohtsuka in his search for a deeper understanding of Karate to practice kata with Mabuni Sensei the founder of Shuto-Ryu Karate. In 1925 Ohtuska's mother died and he was left in a period of indecision about his career. After three years of deep philosophical thought, he left the Kawasaki Bank and set up a "bone setting" practice, similar to a small hospital. His prowess in the Martial Arts had led him to be the Chief Instructor of Shindo Yoshin Ryu Jujitsu and an assistant instructor at Funakoshi Sensei's dojo. By the year 1929 Ohtsuka was a registered member of the Japan Martial Arts Federation. At this time Okinawan Karate only concentrated upon kata, Ohtsuka thought that the full spirit of Budo, which concentrates both upon defence and attack, was missing. Ohtsuka Sensei meanwhile had been developing Yakusoko Kumite to compensate for the lack of attacking techniques. He thought there was a need for a more fluid type of Karate and decided to leave Funakoshi Sensei to concentrate on developing his own style of Karate, "Wado". 1934 proved to be a major year for Ohtsuka and "Wado" Karate. In February Ohtsuka the 2nd (who has recently become the leader of Wado-Ryu Karate) was born. It is uncanny that during this year Wado-Ryu Karate was also "born" and officially recognised to be an independent style. This recognition meant a departure for Ohtsuka from his hospital and a fulfillment of his life's ambition, to become a full time Martial Artist. In 1935 Karate received a further promotion upon Kano Sensei's recommendation to be accepted as a Martial Art, but at first only as an extension of Judo by the Japan Martial Arts Federation. 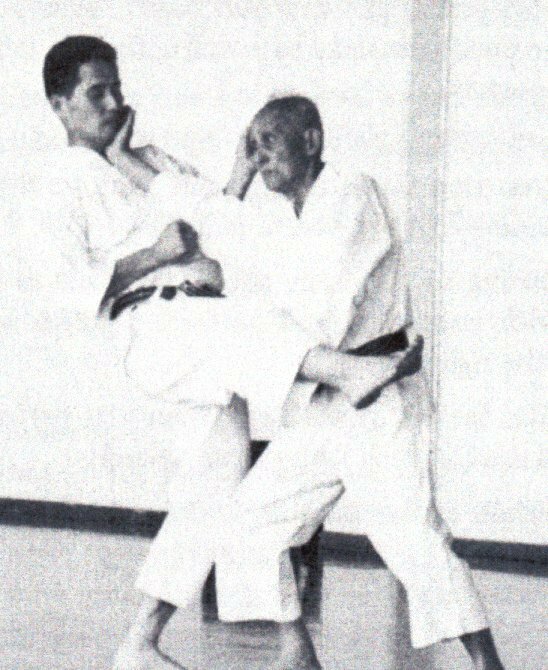 Ohtsuka Sensei's personalised style of Karate was officially registered in 1938 after he was awarded the rank of "Renshi-go". He presented a magnificent demonstration of "Wado" Karate for the Japan Martial Arts Federation who were impressed with his style and commitment and successfully acknowledged him as a high ranking instructor. The next year the Japan Martial Arts Federation asked all the different styles of Karate to register their names. Ohtsuka registered the name of "Wado"-Ryu". Other styles to register included Shotokan Ryu, Goju Ryu and Shito-Ryu. The next few years witnessed Wado Ryu karate growing from strength to strength, new dojos were opening and karate was being taught at the Universities. Ohtsuka himself was becoming a recognised figure within the World of Martial Arts. In 1942 he was awarded the title of Kyoshi-go. 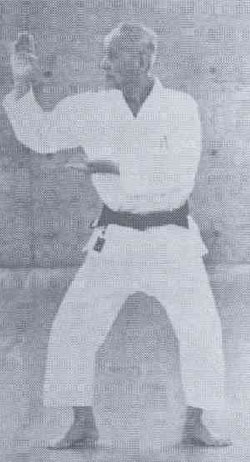 During that year a future great master Tatsuo Suzuki began training in Wado-Ryu Karate. In 1943 Ohtsuka the 2nd began his pursuits in the field of the Martial Arts. He began Kendo under the strict instruction of an army officer called Miyata Sensei. In 1944 Ohtsuka Sensei was appointed Japans Chief Karate instructor and in 1945 Ohtsuka the 2nd began to receive expert instruction from his father. In 1947 Teruo Kono began Karate but did not start training with Ohtsuka Sensei until 1951 and in 1955 the first all Japan Wado-Ryu Karate championships were held. Until the 1960s Martial Arts and especially Wado-Ryu karate remained upon the small islands of Japan. It was hardly recognised outside of the East. This was soon to change. In 1963 a three man team left Japan to conquer America and Europe. The team was composed of Mr. Arakawa, Mr Takashima and Mr T Suzuki. The impressions they left upon America and Europe were tremendous, Wado-Ryu Karate became recognised world-wide for its true merits. Back in Japan in 1966 Ohtsuka Sensei was awarded the title "Kun Goto Suokuo Kyoku jujitsu Shou" by the late Emperor Horohito. It was presented by the Emperor for his dedication to the introduction and teaching of karate. By the early 1970s karate had become truly established world-wide. Ohtsuka continued to train and instruct in Japan, whilst a team of highly qualified Japanese Sensei's continued to spread the doctrines of Wado-Ryu Karate world-wide. 1972 saw Ohtsuka Sensei historically awarded with an honor never before bestowed upon any Karate master, the president of the International Martial Arts Federation, a member of the Japanese royal family, presented Ohtsuka with the title of "Meijin" - the first excellent Marital Artist in Karate (10th Dan) it was the greatest title possible and bestowed upon him. In 1980 Ohtsuka Meijin began to think about retirement as the head of Wado Karate and wanted his son to succeed him as Grand Master. However other high level Wado Karateka were not in favour of this and wished for a different leader to be appointed. Although many negotiations took place no agreement could be reached and some of these Wado Karateka broke away and formed their own association (Wado-Kai). Ohtsuka Meijin continued to lead the World of Wado-Ryu Karate until the 20th November 1981, when he finally decided to abdicate his possession as Grand Master of Wado-Ryu Karate and nominated his son Hironori Ohtsuka 2nd as his successor. Hironori Ohtsuka Meijin peacefully passed away on 19th January 1982, two months later. Throughout the entire world where Marital Arts are practiced he will always be remembered for his enormous contribution and individual devotion to Wado Karate. It is said Hironori Ohtsuka chose the Dove Encircling the Fist as the symbol of his style, representing that peace contains strength. He believed that one who possesses genuine inner strength cannot be provoked to violence, hence will live in harmony with others. He named his style Wado-Ryu, Way of Peace. The inspiration of what he created, and the ideas that he stood for, still lives on today.... And his teaching will continue to be passed from Instructor to Student. Wado Ryu Karate maintained solidarity until just before founder Hironori Ohtsuka passed away in 82. 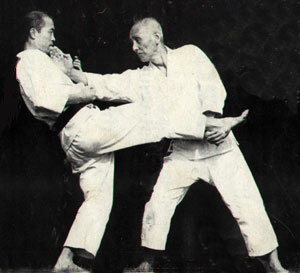 Master Otsuka and his son perform the seventh kihon kumite kata. Jiro is the head of Wado Ryu Renmi, which is located in Japan. In 1989, Jiro changed his name to Hironori Ohtsuka II, succeeding his father. With differing interpretations and changes taking place on a regular basis, Wado Ryu became a split entity.